Dr. Russell Gura received his undergraduate degree from SUNY Binghamton and attended the SUNY Health Science Center at Brooklyn Medical School where he was elected to the Alpha Omega Alpha Medical Honor Society. He joined Leonia Medical Associates after completing his residency in Internal Medicine at Montefiore Medical Center in 1998 where he received the Leo M. Davidoff Society Award for outstanding achievement in the teaching of medical students. Since joining Englewood Hospital and Medical Center he has been an active member of the medical staff serving on the Medical Executive Committee and holding the position of Associate Section Chief of the Internal Medicine division of the Department of Medicine from 2006-2010. He currently is Chairman of the Bylaws Committee. In addition to evaluating and treating the full spectrum of adult medical ailments, Dr. Gura has a special interest in improving the health of overweight and obese patients. He believes exercise is essential to staying healthy and functional. He has run the New York City Marathon three times and enjoys rock climbing. 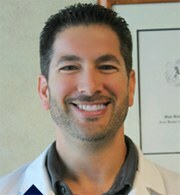 Dr. Gura now sees patients in West Nyack, N.Y.